Whisk flour, pecans, baking powder, salt and baking soda in medium mixing bowl to blend. In large mixing bowl, whisk eggs, milk, sour cream, butter and vanilla. Gradually whisk in dry ingredients until blended. Pour 1 cup batter evenly over heated 8-inch square waffle iron. Cook until waffles are golden brown on both sides. Repeat with remaining batter. Melt ½ cup (1 stick) Darigold butter in small saucepan; stir in 1 cup favorite maple syrup and cook over medium heat until syrup is warm. Stir in ½ cup coarsely chopped toasted pecans. 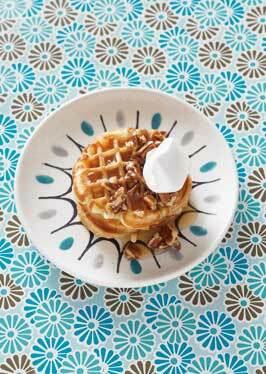 Serve warm over hot waffles. Makes about 12 4-inch waffle squares. Add 2 tablespoons sugar for added browning and a bit of sweetness to the waffle.